The PALIT NVIDIA GeForce RTX 2060 delivers a superior PC gaming experience. Powered by the new NVIDIA Turing GPU architecture that has increased memory bandwidth and more Cuda cores improving on the previous Pascal Architecture, RTX graphics cards combine real-time ray tracing, artificial intelligence, and programmable shading. Featuring 6GB GDDR6 memory, this is a completely new way to experience games. With PALIT's Thunder Master Overclocking software monitor your cards clock speed, thermals and much more whilst also optimizing your gaming so that you can tune your card to increase performance. 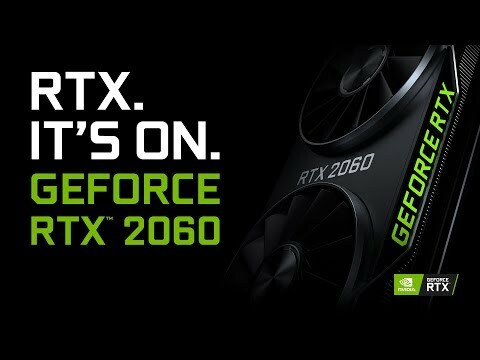 Up to 6 times faster performance The RTX 2060 GPUs are powered by the Turing Architecture, this gives you 6x faster performance over previous-generation graphics cards. With increased memory bandwidth, more Cuda cores and using a new 12nm manufacturing process the new Turing architecture is the most powerful GPU architecture. Boost your GPU and utilise every bit of power To optimize the features of GeForce Series, Palit has revealed the enhanced ThunderMaster overclocking tool that utilizes NVIDIA GPU Boost technology for intelligent monitoring of clock speed, ensuring that the GPU runs safely at its peak and the game is at its highest frame rate. It also offers new levels of customization, including GPU Temperature Target and Frame Rate Target control.